I’ve had these bad boys sitting in my photo album waiting to be published for a bit of time, if I’m being perfectly honest. Sort of a, save it for a rainy day blog post. Which, I guess really isn’t today I’m realizing as I looking outside and its that perfect spring day with the beautiful afternoon sun setting in my back yard. So, now it’s my save it for a sunny day recipe. Anyways I stumbled across these and thought that with all the terrible things happening in Boston right now, I would show some support to this wonderful city. 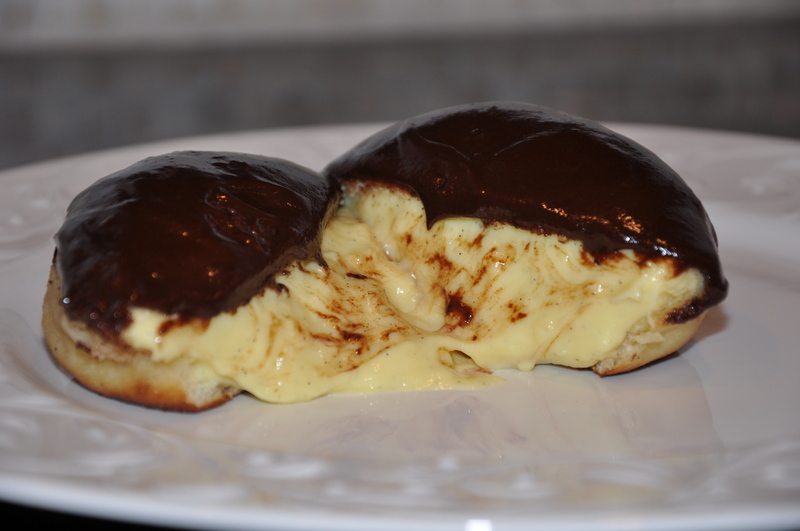 With some good ol’ Boston Creams. The recipe is actually pretty complicated, and it took a better part of our Sunday together so lets make sure you have time to commit and enough windows to air our the kitchen ;)! Scroll all the way down for the recipe! I actually found it from SophistiMom’s Blog with a few of my own changes! I used a not-too-sweet pastry cream that I’ve used before as a filling. Look how big they got! Super light and airy on the inside! The waiting around was sort of the hardest part! Once the pastry cream was made and the yeast set up, it felt like it was time to eat! But, alas, good things come to those who wait… for about 4 more hours! 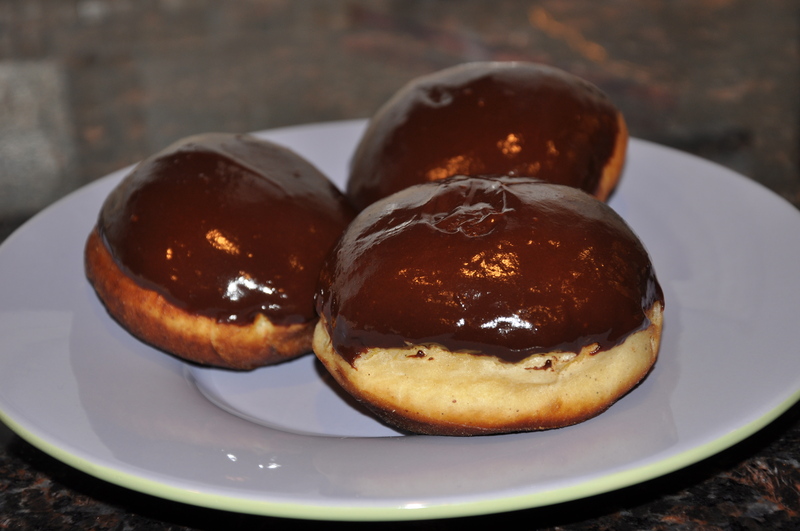 I’m not even a big doughnut person, my favorite was the combination of chocolate-pastry cream; to me the doughnut was really just a carbohydrate delivery system to get the other 2 ingredients into my mouth. Dipping Shot! Front row seats, right in the action people! 1. 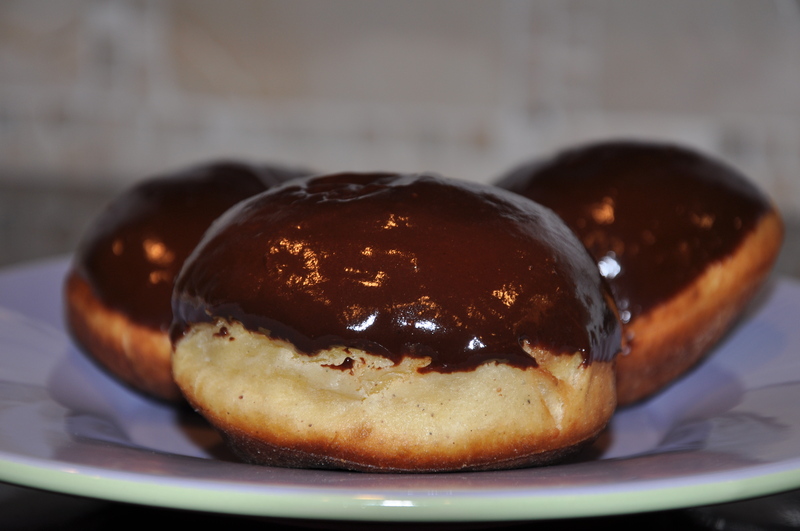 Make pastry cream first and let set in fridge (click here for recipe) until ready to use. In a small cup measure, combine 1/4 cup warm water with yeast and a pinch of sugar. Let dissolve. It is ready to use when bubbles form on the surface. 2. 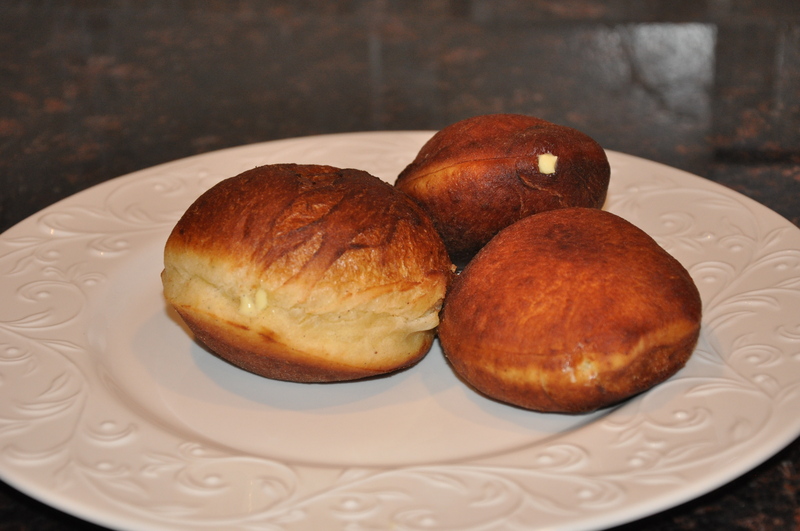 In an electric mixer, combine flour, sugar, 1 cup of warm water, eggs, butter, and salt. Let it run in the machine on low for 10 minutes, until the dough is smooth and elastic. Turn out onto a floured board and knead for a minute more by hand, adding just enough flour to keep it from sticking to the board. Return dough to the bowl and cover with a towel until doubled in bulk. 3. Bring oil to 325-350 degrees. Roll out dough until thin (about 1/4-1/2 inch). Cut with a 3 inch round cookie cutter. Gently dough into the hot oil (I did one-by-one). Fry on both sides until golden brown, about a minute on each side. Remove to paper towels to cool. 1. Bring heavy cream to a boil in a medium saucepan. 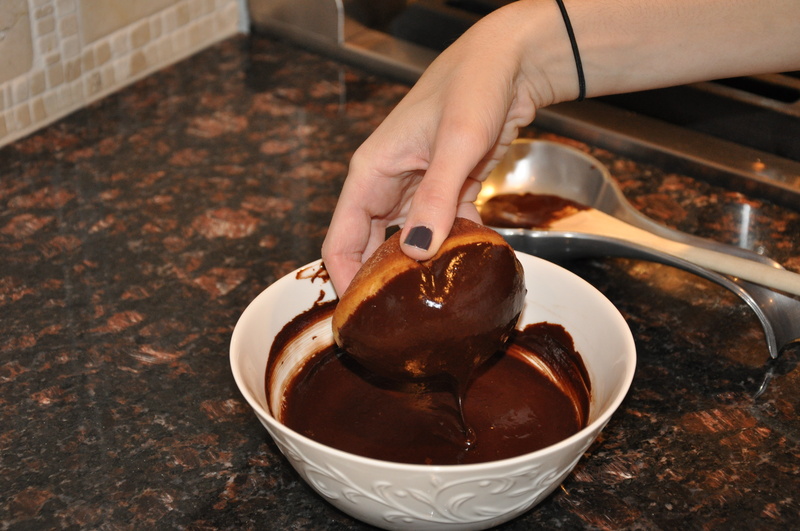 Pour over chocolate chips, honey, and vanilla. Let sit for five minutes. Coming soon, birthday cakes and celebrations! :D One of them is for yours truly!